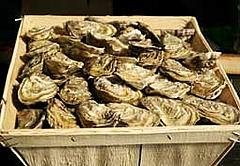 France is a major producer of oysters for consumption in the EU and this trade has deep historical roots along its Celtic Sea and western Channel coastlines. A recent interview with Mr Benoit Beliaeff, IFREMER Director of the Department of Biological Resources and Environment, put the spotlight back on the mortality of farmed Pacific oysters (Crassostrea gigas) from several coastal locations in France. While summer oyster mortality has been observed for almost two decades in France, the amplitude and distribution of this phenomenon has reached crisis proportions in the last four years: 70% to 80% of oysters less than one year old have been dying every year since 2008. Adult oysters and other farmed molluscs are less affected. Concurrent infection from a herpes-type virus and a bacterium (Vibrio splendidus) has been identified as a definite cause, however environmental factors such as rapid increase in sea surface temperature to 16º C in spring also plays a role. Managing this crisis has proved challenging since traditional management approaches for mariculture species such as vaccination or other medical treatments cannot be applied to invertebrates like oysters. A first measure, formalised at EU level, regulates movement control of larvae, spat and adults, to prevent the spread of infections to areas currently still free of mortality such as the UK and Ireland (all of coastal France is affected, so this approach benefits EU oyster farms). Another measure focuses on improving genetic selection to understand why certain types of oysters resist summer mortality. This led to the implementation of “safeguard plans” in 2010/2011- utilising the oyster families of the genetic type with a better chance of survival to provide larvae for mariculturists to rear. Future efforts will focus on a better understanding of the relationship between the pathogens (viral and bacterial) and the influence of environmental factors on this relationship. The production and farming of oysters and mariculture is an important industry to people who live in the Celtic Sea area and this work in France empahsises the urgent need for effective management measures on a regional scale to find solutions.